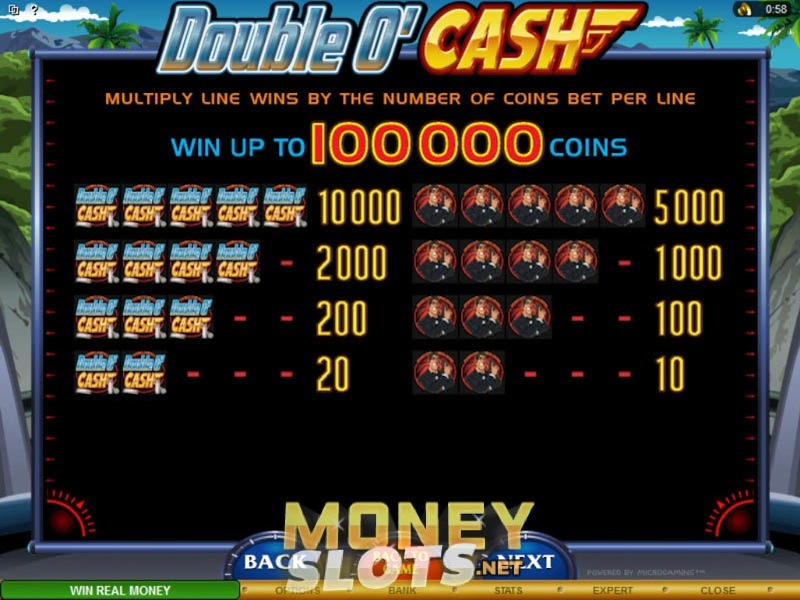 Double O’ Cash is a video slot game machine created by Microgaming. The game is about espionage and one secret agent in an online casino and it is a bit similar as Agent Jane Blonde. It is splendidly designed and overwhelms you completely, although you are still free to use Autoplay mode. Double O' Cash is a 5-reel, 25 payline, non progressive video slot machine with a scatter symbol, multiplier, bonus game, free spins and and Bonus Mission. To start on a mission of infiltrating into the enemy gang, make a bet of $0.01 to $100. For a start, you need to get fully armed to go on with your deadly dangerous mission. Your secret agent weapons include Martini, Gun, Helicopter, and Villain’s Chain. However, all of these weapons are lying at the bottom of the payout chart, so there is no need to pay too frequent visits to the arms cache. To enter the gang under cover, you’ll first have to steal the Villain’s Cat and then present it to the villain in the company of beautiful Blondes and Brunettes, after which your task will include finding the cool Motorbike. All of these symbols will help you rise up the payout chart, so bend over back-words to keep on that high level and don’t slide downhill. When you encounter your helper (the Spy symbol), be ready to open your pockets for the minor jackpot of the game! What about the first prize, though? The primary jackpot is concealed under a string of Double O’ Cash symbols, so bless your fortune upon seeing them, lined up and welcoming you!